For surely if everything else aboard this tiny vessel is like that which we are now facing, and amongst which we are soon to be immersed for a whole eight days, we wonder should we rather be kitted-out in khakis and pith helmets from another era, and not our so-recently acquired fashions of the 21st century? 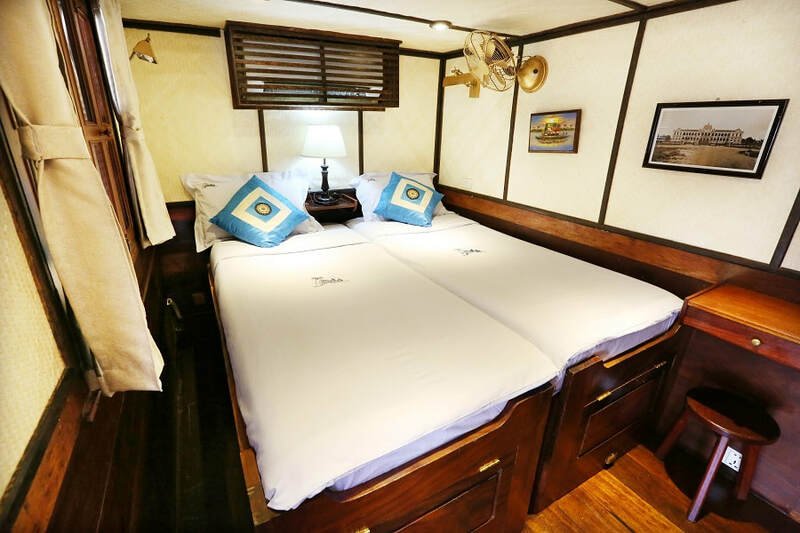 Because although launched just sixteen years ago in 2002, Toum Tiou 1 was built in the traditional style of Mekong riverboats of colonial France many, many decades past, and delightfully finished and decorated throughout in the tasteful style of those eras gone by. 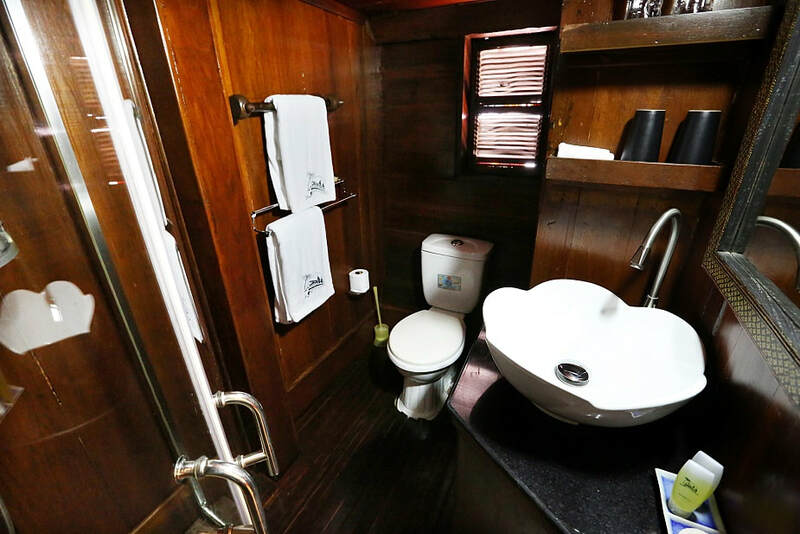 This includes lacquered wooden panelling, brass fittings, wickerwork armchairs for relaxing on top-deck, almost antique furnishings, and traditional woven straw wall coverings to mention just a few. And all of which contribute to a sailing vacation that’s a virtual yesteryear-on-water, and which most who’ve already indulged, say is simply unmatched. 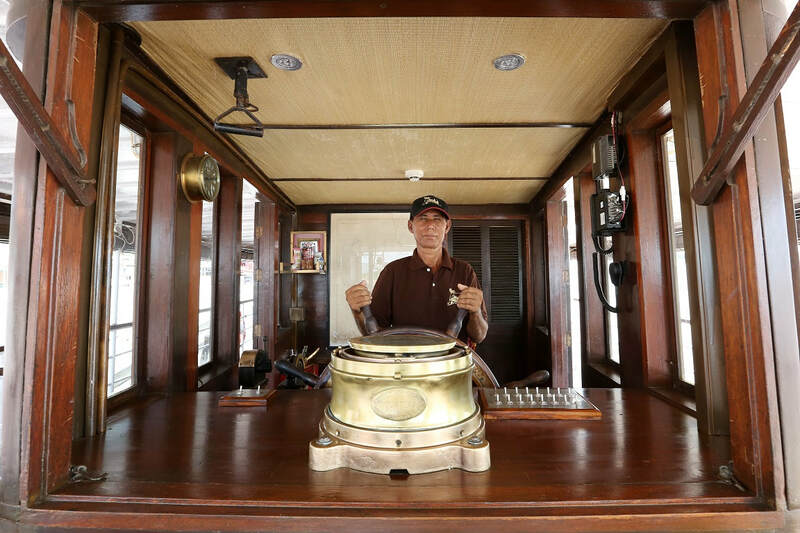 At a tiny 38m in length, this little gem carries just twenty guests in ten cabins, and because of her shallow draft of 1.7m can sail at literally arm’s length of riverbanks and beaches, jungles’ flora and fauna, and villages and historic buildings for wonderfully up-close viewing and picture-snapping. 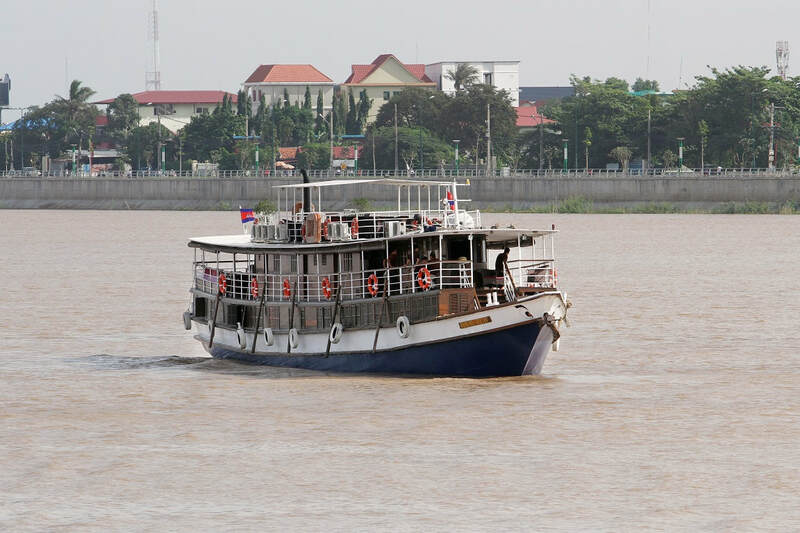 And that shallow draft means she and sister-ship Toum Tiou 2 are the only passenger vessels that can sail the Mekong unhindered for a near 500km from Ho Chi Minh City to Siem Reap, as others on the river have to transfer passengers to buses in places where waters are too shallow for them to cross. We had chosen an 8-day sailing on Toum Tiou 1 that was a sell-out with almost half those on board French, and the remainder Australian and English, all pampered throughout by an enthusiastic Captain, officers and crew determined we should go home with lifetime memories. And our waiters manning the dining areas both indoors and out, quietly responded to the mix of nationalities amongst us, setting up two large tables in each area, one for those French guests who basically spoke no English, and another for we English-speakers who basically spoke no French. Plus dining itself was a delightful foray into Vietnamese and Cambodian fare of the regions through which we passed daily. And awaiting us at each day’s end was our comfortable air-conditioned cabin with king bed and a hair-dryer for m’lady. 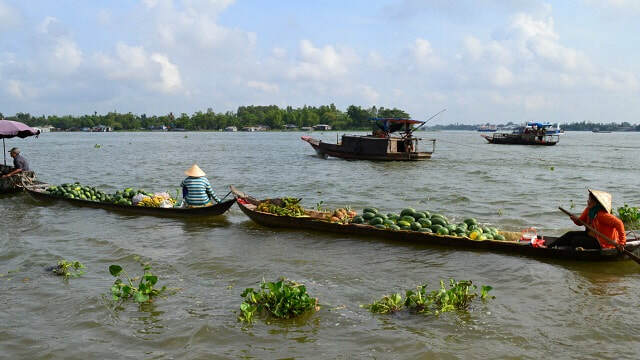 And sights ranged from the amazing ruins of Angkor Wat, at 163ha (402 acres) the largest religious monument in the world, to buzzing markets with their diversities of fruits and vegetables, seafoods and meat products. Plus we poked our noses into village life on shore and on stilts over the river, and probably most-memorable of all, dropped into a class at a tiny school where the kids’ boisterous welcome for us was nothing short of eye-watering. 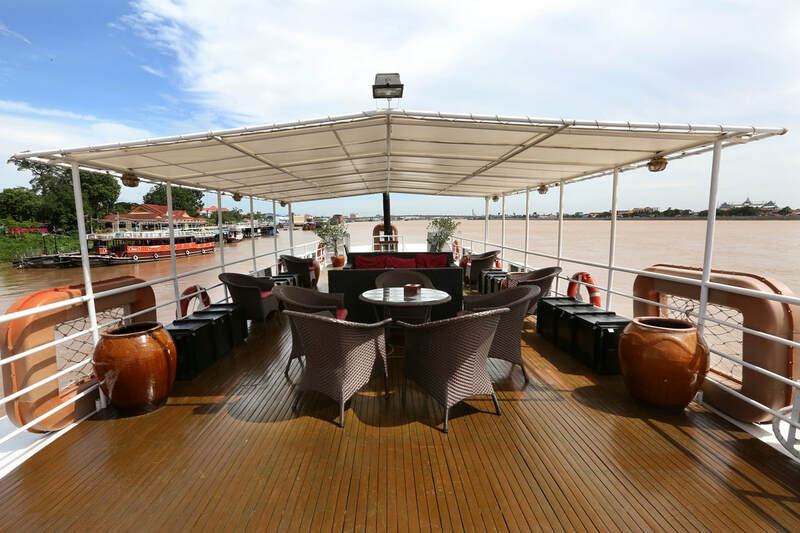 Toum Tiou 1 also offered onboard cooking classes where we learned a bit about how to whip-up Asian delights on our return home, talks were given on the region’s history and culture, and there was even gear aboard for a spot of fishing too. Certainly one of the more unusual and memorable of on-water holidays, 8-days aboard the little ten-cabin Toum Tiou 1 starts from USD$3699 for a double/twin cabin for two (for one person from USD$2799,) including meals, some drinks, daily and sometimes twice-daily shore excursions with English and French speaking guides, and entrance fees. For more information or to book, see your licensed travel agent.